In a Crowdicity community, the community administrator will ask users to post ideas in response to challenges, challenges are questions or discussion topics. To post an idea in a Crowdicity community, you have to choose a challenge in which you'd like to post your idea. Don't know how? Don't worry, we have you covered. 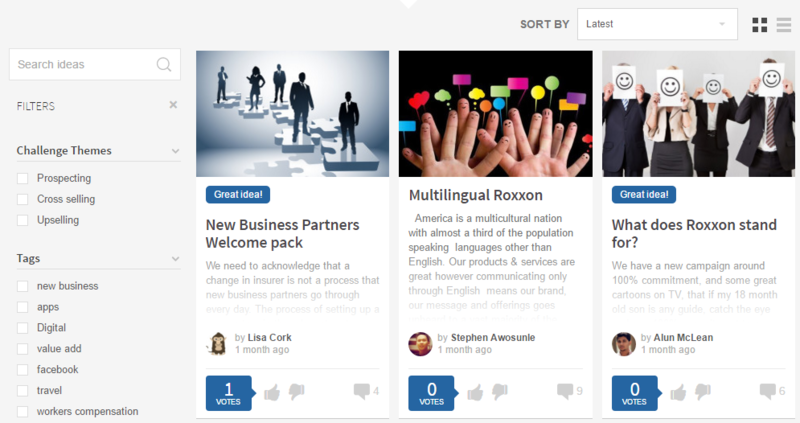 There are two ways that you can post a new idea: from the challenge page and from the navigation menu. If you are looking at a challenge while inspiration strikes, click on the 'Post an idea' button underneath the challenge brief. The text on the the post an idea button and its colour can be changed by community administrators, so it may look a little different from our example. Wherever you are in a Crowdicity community, you will see the 'New idea' button in the navigation menu. The colour of the button varies depending on the community, but you will find it towards the right of the navigation menu, next to your profile picture. 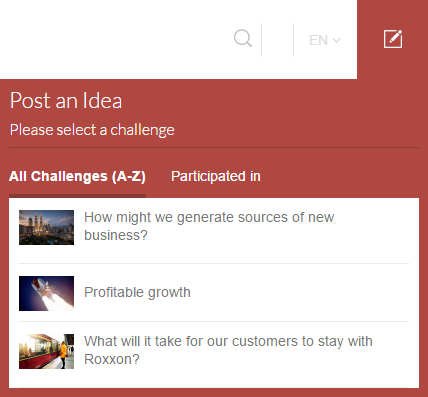 When you click on the new idea button, you will see a list of challenges in which you can post an idea. 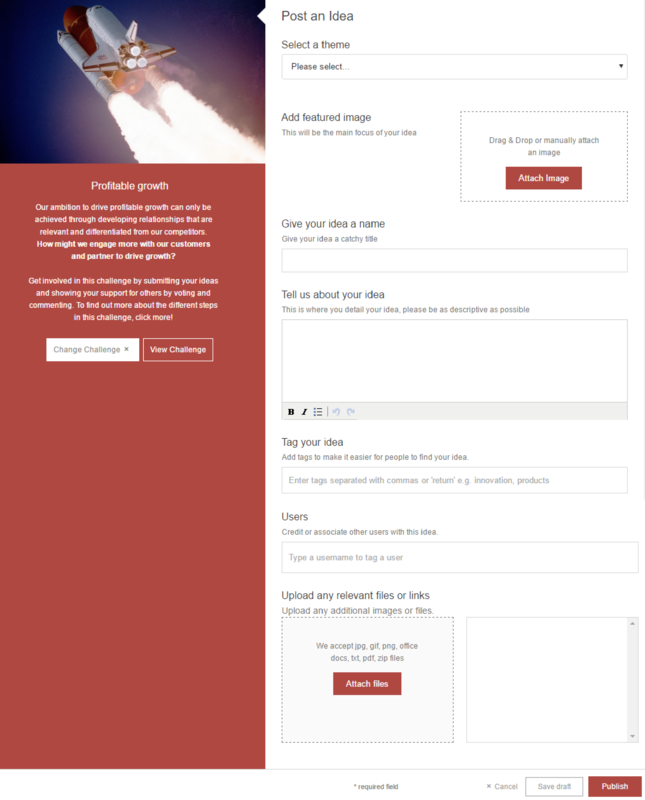 Click on a challenge to bring up the idea submission form. 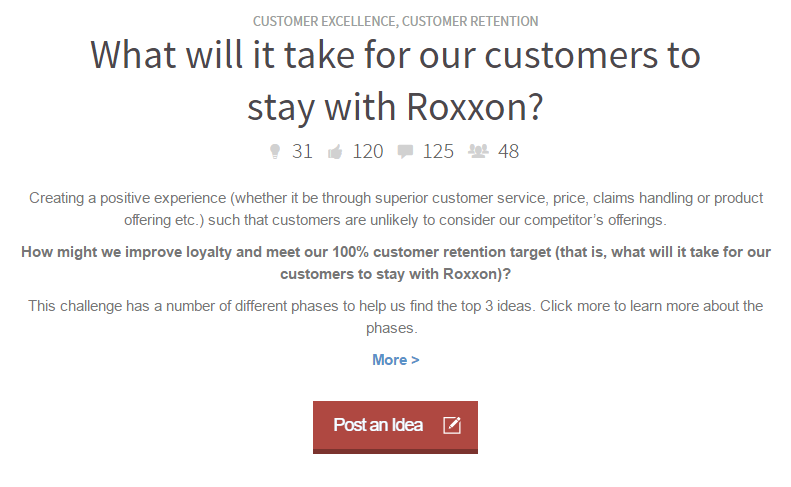 The idea submission form captures all of the information needed to post your idea. On the left hand side you can see which challenge you're about to post the idea to, and the right hand side shows the fields that you need to complete. You'll need to add a name for your idea and a description. There may be other fields to fill in depending on how the challenge has been set up. If you start creating an idea but aren't ready to finish it, you can click Save draft at the bottom of the idea submission form. Themes are subcategories within a challenge. You can choose to post your idea into a theme, or if you don't select a theme, your idea will be posted into the challenge as a whole, rather than appearing in one of the themes. To select a theme, click on the drop down box arrow and choose the theme that your idea fits into. Click on the ‘Attach image’ button in the featured image box, find the image you want to add and click Open/Done. You will need to enter a name for your idea; titles that work best are succinct and capture the main point of the idea. When writing the title of your idea, Crowdicity will check it against those already posted in the challenge. If you're title has similar words to another idea, you'll see an alert to show you any 'Possibly related posts'. This will present you with a links to potentially similar ideas so you can click to check what's already been posted. You must also provide a description for your idea, exactly what you need to include will vary depending on the challenge. Read the instructions in the challenge brief carefully so that you understand what the community administrator would like you to include. After you have answered the relevant questions on the form, you can add tags to your idea, these are like hashtags on twitter, they help users to find your idea when they are searching for particular subjects. Enter any key words or phrases and separate them by a comma to add them as a tag. 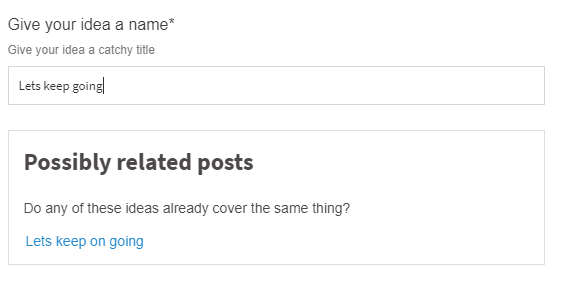 You can add up to 10 tags to your idea. You can use this field to tag up to 10 other users in the community, to notify them about your idea or comment, or to credit them with helping to develop the idea. Tagging key words and users in ideas are both optional features and may not be available in your community. You can upload additional images or files to your idea. 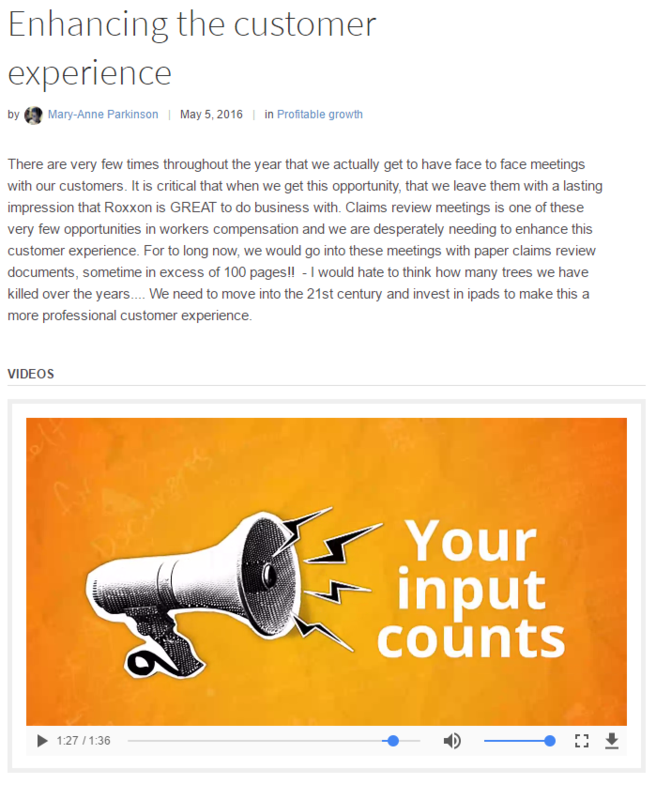 If you add additional images to your idea, they will be presented in the challenge page as a ‘lightbox’ – a collage view that can be clicked to scroll through each image. You can also add files to support your idea, for example, an excel spreadsheet, pdf, etc. To add either an image or file or video, you can either drag and drop the file into the additional files box or click on Attach files to open the uploader. If you add a video to your idea it will appear below the idea description. 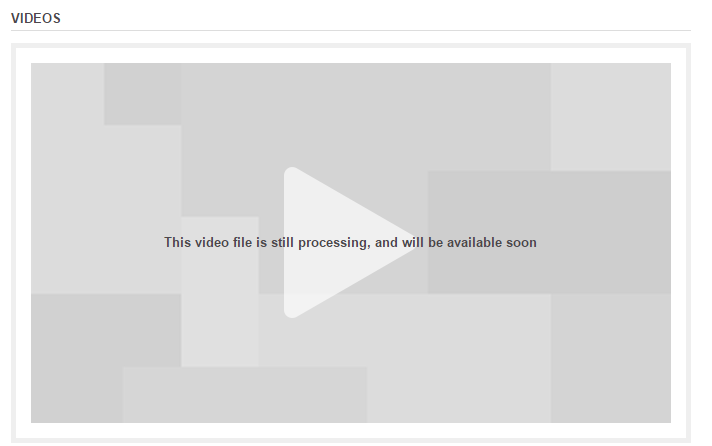 Videos are played on the page, without the need to download a video or leave the page. Depending on the size of the file, it might take a few minutes for your video to display on your idea. If it's not ready, you will see a grey background in the video player, which will change to show your video as soon as it's available. When you have finished the form, click Publish. A message will pop up to tell you that your idea has been submitted. If you're not ready to publish your idea, you can save it as a draft by clicking the Save draft button. To learn more about idea drafts, have a look at our guide to saving your idea as a draft. If your idea isn't visible when you click publish, it may be because any new ideas must be moderated before they are visible to the rest of the community. Want to go over anything again?